There is nothing like a bit of monkey business especially when it involves monkeys! I used to own quite a collection of photographic equipment. Nowadays I make do with a camera phone and a point and shoot digicam. I started to go through my Flickr account to download some old photos to use as a post in its own right. I had forgotten how many pictures I have on there, so I am grateful to Sandy for making me concentrate my mind and running a regular #FavFotoFriday spot. This first #FavFotoFriday spot takes place in the Papillon Beach Resort, Mombasa, Kenya where I stayed back in 2009 for a wedding. I was staying in a second floor room (first floor in the UK) and ventured out onto the balcony to sit down and read a book. In those days, my camera was always close at hand. Just as well, as I spotted two of a troop of local Colobus monkeys running along the balcony rail. One disappeared for a while then reappeared carrying its ill-gotten gains in its arms. 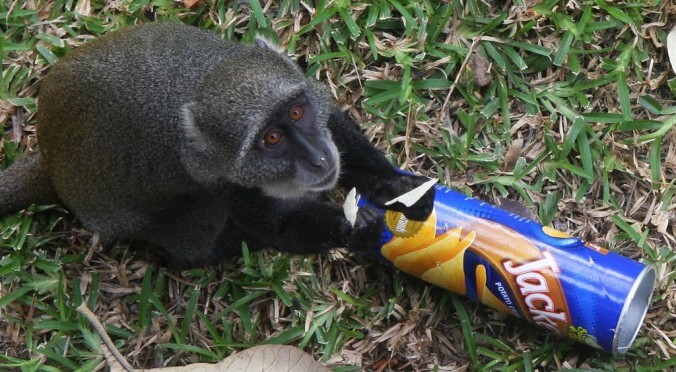 The monkey had “illegally” entered an adjacent room and made off with a tube of chips (crisps) similar to a pack of Pringles. That in itself was hilarious. What followed was even funnier. The monkey firstly scurried down to the ground and settled down for a feast. It soon figured out how to get into the pack and removed the plastic top with its teeth. Its arm was in and out of that tube shovelling the chips into its mouth as fast as possible. It didn’t want its brothers, sisters and elders from the rest of the troop joining in. This monkey was not for sharing the loot! There was a large troop of Colobus monkeys at the hotel complex. Yes, they look cute but could be a damn nuisance at the restaurant. They would suddenly leap onto your table and grab whatever food they could find! You wouldn’t hear them coming – just a loud bang as they landed on the table and whoosh! They were gone again. They were a nuisance, but I did feel sorry for them when the security guards took aim and fired their sling shots at the troop in the trees as a deterrent. If you would like to see all of the photos I took of this “crime” then please click here and you can view them at my Flickr account. Love these!!! I have always wanted a monkey…despite them being pests in some places. And I love animal antics anyway. Great post! And such an awesome addition to Fav Foto Friday! Thanks for participating!